A new FAQ for The Lord of the Rings: The Card Game is now available for download (pdf, 13.7 MB). Since 2011, The Lord of the Rings: The Card Game has given fans unparalleled access to the many realms of Middle-earth. 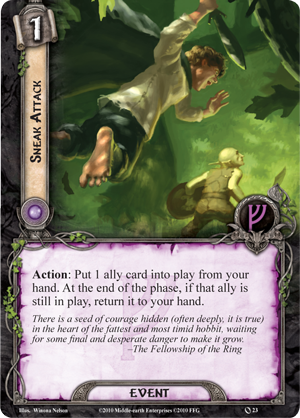 The game's Core Set and standard expansions have allowed us to imagine new, untold tales in the years between Bilbo's mysterious departure from the Shire and the beginning of Frodo's epic quest. Meanwhile, an increasing number of Saga expansions have provided us with the opportunity to imagine ourselves as members of Thorin and Company or the Nine Walkers. Along the way, we have also enjoyed the unique experiences made possible by a handful of standalone scenarios and the dozens of Nightmare Decks that transform the game's original scenarios, recasting them in the darker and deadlier shadows of Nightmare Mode. These myriad products have allowed us to travel all across Middle-earth, from Mirkwood to Moria and from the Shire to the Mountains of Shadow. Each scenario has been, in effect, a new game framed within the same setting and general mechanics, and taken together, these many quests have given us the chance to discover secrets about the different realms, the different races, and even our various heroes. We've seen both the good and the bad of troubled characters such as Gríma Wormtongue and Saruman the White. We've also encountered people, places, and—perhaps—even some situations that may have left us with questions we hoped might be answered. Many of those answers arrive today with the new FAQ, and developer Caleb Grace addresses some of what you may expect to find within its pages. Developing The Lord of the Rings: The Card Game is a wonderful privilege and an exciting challenge for the design team. We are deeply grateful to everyone who plays the game, and it is our goal to provide you with the most rewarding gaming experience possible. To that end, we have updated our FAQ to answer some commonly asked questions, clarify a few rules, and issue a few errata necessary to the long term health of the game. It has been a year since The Lord of the Rings: The Card Game received an FAQ update. During that time, the game and its community have continued to thrive and grow, enjoying a steady influx of new products and new players. In order to ensure that the game continues to provide the best possible gaming experience to all players, the design team has updated the FAQ to address recurring rules questions and errata a couple of problematic cards. 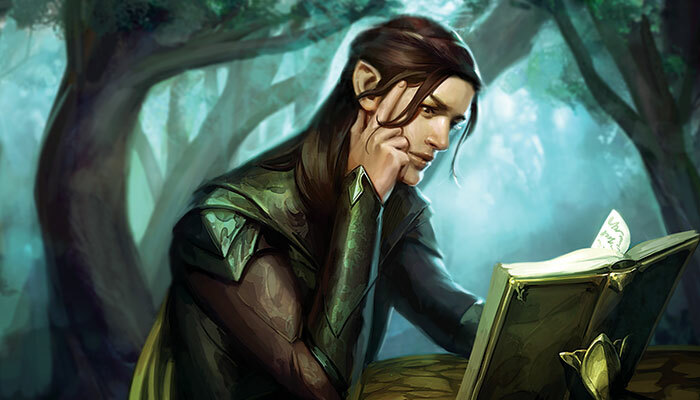 A total of four cards received errata in this new FAQ: Horn of Gondor (Core Set, 42), Love of Tales (The Long Dark, 85), Devilry of Saruman (The Treason of Saruman, 43), and The Passage of the Marshes (The Land of Shadow, 67). The last two are minor corrections to the original text. 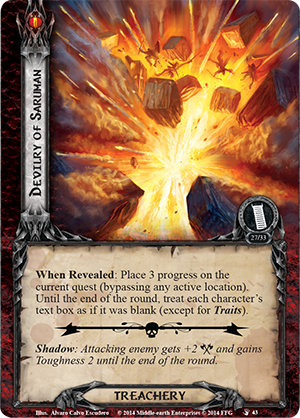 Devilry of Saruman was edited to read: “When Revealed: Place 3 progress on the main quest…” instead of “Place 3 progress on the current quest…” The reason for this change is to make it clear that Devilry of Saruman does not help players to complete side quests while playing Helm’s Deep. The campaign card for The Passage of the Marshes was always meant to allow players to change their hero cards without incurring the one-point threat penalty in Campaign Mode, and the errata for that card simply adds that ability. As for the other two errata included in this updated FAQ, both Horn of Gondor and Love of Tales were deemed too powerful in their current form because of the potential for abuse. 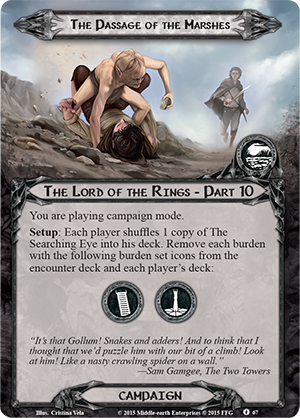 Both attachments provide a way for the controlling player to generate resources, and because managing resources is a core element of The Lord of the Rings: The Card Game, cards need to be balanced by their resource cost. The problem with the current version of Horn of Gondor and Love of Tales is that they provided players with the means to gain resources in a manner that trivialized the resource cost and broke the balance of the game. Therefore, each attachment received an errata intended to limit the number of resources a player can gain from its ability. 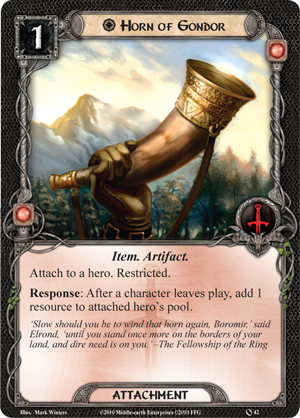 Horn of Gondor has an important place in The Lord of the Rings: The Card Game, particularly in the Core Set experience. The Tactics player is usually expected to engage enemies and defend their attacks in order to defeat them, but this often means that their allies are destroyed by those enemy attacks. Therefore, it is important to the Tactics player to have a way of gaining resources in order to play more allies to replace those losses. Horn of Gondor provides those resources by giving the attached hero a resource whenever a character leaves play. However, because its Response triggers “After a character leaves play…” instead of “After a character is destroyed…” it left its ability open to all types of abuses. The design team has corrected this by changing Horn of Gondor to read: “Response: After a character is destroyed, add 1 resource to attached hero’s pool.” We believe this errata balances the Horn of Gondor in the game while preserving its original intended use. 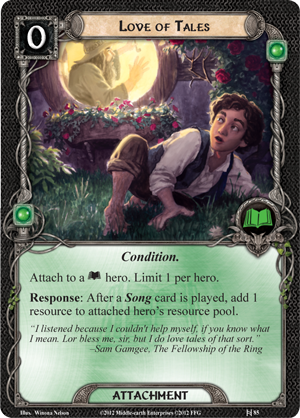 Love of Tales gives the attached hero a resource each time a Song card is played. This ability was originally limited by the number of Song cards available in the game. However, as the game has grown and the number of Song cards increased, the ability has become too powerful to be without limit. Therefore, Love of Tales has been changed to read: “Response: After a Song card is played, exhaust Love of Tales to add 1 resource to attached hero’s pool.” By adding the cost “exhaust Love of Tales” in order to gain the resource, this limits the number of resources the attached hero can gain to one per round, which is the appropriate amount of resources for a hero to gain from a non-unique, zero-cost attachment. In addition to these errata, the FAQ addresses a few recurring rules questions in the Rules Clarifications and the Q&A segments. Notably, it introduces a new section to address “Lasting Effects.” This section distinguishes two different classes of lasting effects in The Lord of the Rings: The Card Game—those created by player card abilities and those created by encounter card abilities. Each class has its own rules. Lasting effects created by player card abilities are calculated at the time they are triggered, and they are not recalculated if the game state changes. For example, if you trigger the Action on Faramir (Core Set, 14), it creates a lasting effect, until the end of the phase, that gives a bonus point of Willpower to each character controlled by the targeted player. 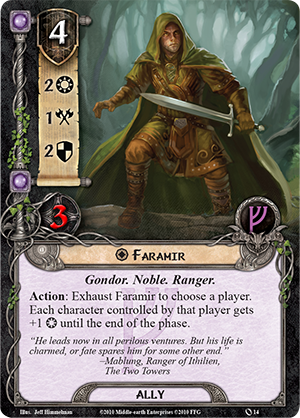 If the teammate you targeted then uses Sneak Attack (Core Set, 23) to put an ally into play later that phase, that ally will not get the bonus Willpower from Faramir’s lasting effect because it was not in play at the time Faramir’s ability was triggered. However, lasting effects created by encounter cards are handled differently. They are recalculated whenever the game state changes. This is done to simplify the game and reduce the burden on players' memories. 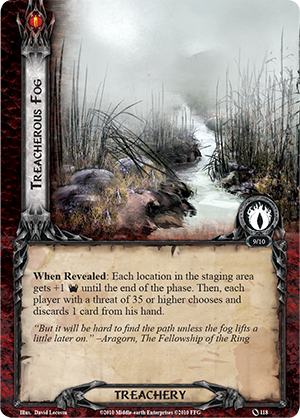 For example, the "When revealed" effect on the treachery card Treacherous Fog (Core Set, 118) creates a lasting effect: “Each location in the staging area gets +1 Threat strength until the end of the phase.” If this card were treated like a player card, you would need to determine which locations were in play at the time that Treacherous Fog granted them a boost to their Threat strength and which were revealed afterward. Instead, because you recalculate the lasting effects created by encounter card abilities with each change in game state, you can simply apply the one-point Threat strength bonus to each location in the staging area at the end of the staging step, regardless of when it was added to the staging area. You don't also need to remember the order in which the cards were revealed. The design team is confident that these updates will improve each player’s understanding and enjoyment of The Lord of the Rings: The Card Game. Where Will You Adventure Next? 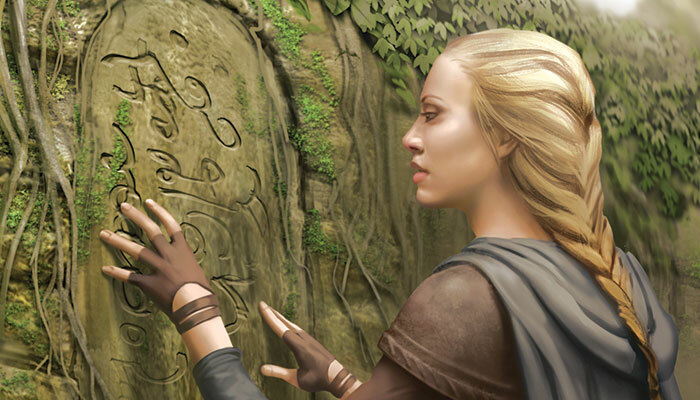 With The Grey Havens nearly on the horizon, and much more yet to come, where will you next adventure in Middle-earth? Will you head west to the port of Mithlond? Will you retrace your steps through the Mines of Moria, but this time in Nightmare Mode? Will you explore the unique challenges of a standalone scenario like The Stone of Erech, or the soon-to-be-released The Ruins of Belegost and Murder at the Prancing Pony? No matter where your journeys take you next, you'll find that The Lord of the Rings: The Card Game continues to embrace the heroic, high-fantasy spirit of Middle-earth, and you'll enjoy the clarity provided by the new FAQ (pdf, 13.7 MB) or the printer-friendly FAQ (pdf, 846.3 KB). Download your copy today! The Lord of the Rings: The Card Game is a cooperative card game that puts one to two players (or up to four with an additional Core Set) in control of the most powerful characters and artifacts of Middle-earth. Players will select heroes, gather allies, acquire artifacts, and coordinate their efforts to face Middle-earth’s most dangerous fiends. The Living Card Game format allows players to customize their gaming experience with monthly Adventure Pack expansions to the core game.